Digital Only and Unlimited Prints provide a classic, low-cost, easy-to-book photo booth experience. Custom is for greater flexibility and creativity; choose any props, backdrop, prints, or tell us your vision and we'll customize to fit your event. All photo booth services include staff support during the event, equipment, set-up and take-town, and digital uploads to an unique URL. 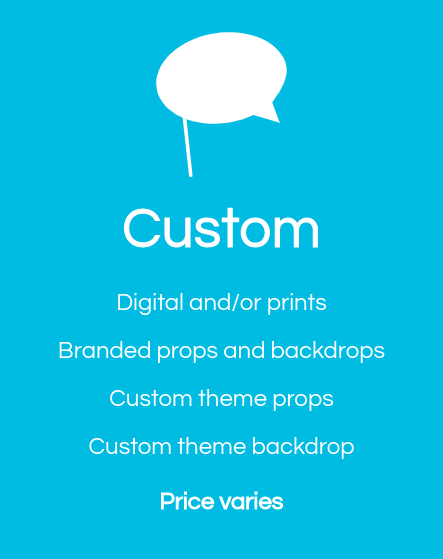 We offer a wide variety of props and backdrops, and can also make custom props or backdrops just for your event. All items are included in the price of the photo booth except those labeled (+$). No idea where to start, but want something spectacular? Contact us and we'll create a vision together.